I'm already quoted as being a big fan of Kenosha and its old school not much has changed atmosphere. Its also got quite a few good eating spots for typical lunch fare like burgers and sandwiches and other fun stuff like that. Im a big fan of Tenuta's and if in the area consider it a must stop. Where else in the world can you get some olive oil from Sardinia, a Dominican hand rolled cigar, some fresh homemade sausage, Imported cheese and olives and a a keg of Spotted Cow all in one swoop? I also happen to be fan of the homemade meat lasagna sold by the piece to go from the deli counter and their popular Muffaletta's. 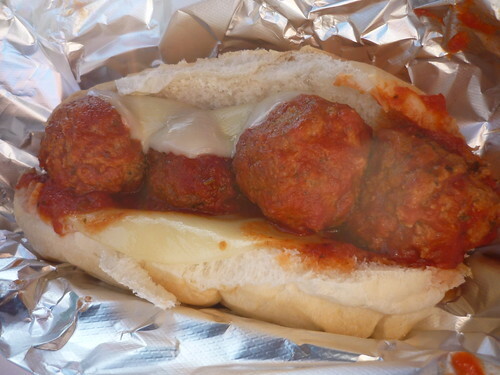 I still haven't gotten around to trying their beef bombers but the meatball bomber is very good and one of my favorite sandwiches there. Lenci's isnt nearly as big as Tenuta's but as the sign says its been around since 1965 and on the day i visited they had a steady amount of traffic from neighborhood people walking and ordering food from the back. Upon entry there's the cash register and some fresh fruits/veggies and grocery items then along the walk back there's some refrigerated cases dry goods and a deli counter with a kitchen in back. 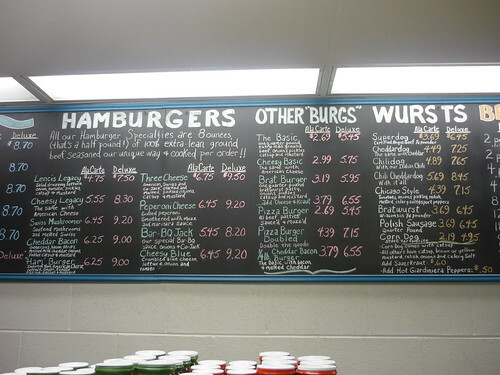 The menu is quite large and my first thought was to try a burger. Another thing they all have in common is young kids most likely in high school working at them. So my first plan was to get a burger but then I asked the kids working what was their most popular sandwich? He said "oh we easily sell more beef bombers than anything else by far" My first thought was maybe the kid is lazy and doesnt wanna make me anything that takes time and a beef bomber is the easiest thing to prepare. I also wasn't sure about this whole Italian beef bomber thing I see at all these Italian delis in Kenosha. I've been everywhere for a Italian beef in Chi and I wasn't expecting much from these places. So I ordered it anyway b/c I was curious what the history is with the bomber sandwich in kenosha, seems to be their own little signature regional sandwich. At first glance it wasn't really appealing to me. I much prefer my Italian beef sliced extra thin ala pop's and places like that. 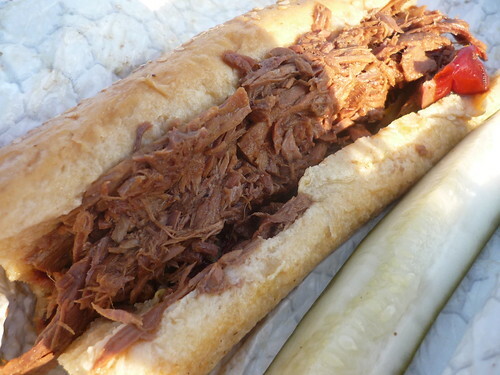 But this isn't a Chicago style Italian beef, its a Kenosha style beef bomber. So I dug in and was greatly surprised. The beef was about as tender as it can get and it fell apart upon contact while the bread, most likely homemade from one of the Italian bakeries in town stood up to the aus jus and it held together well. It was a real treat and for someone who loves Italian beef as much as I do I then became in love with beef bombers. So before I get to the next spot let me ask. Does anyone know any history about the bombers in Kenosha? it seems as though most of the old school spots serve them and Im sure they are on the pizza places menus too (I heard Kenosha has more pizza spots per capita than anywhere in the US) It seems like they may have originated as Italian roast beef bombers bit now many places offer meatball, sausage, combo and even ham bombers. The norm seems to be they are avail with or without cheese and with our without giardineria. Basically just hot deli sandwiches but they all call them bombers. 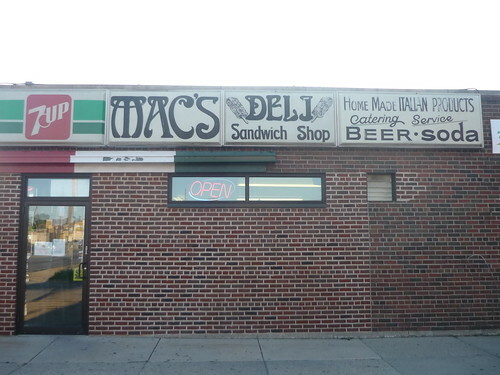 Then there is Mac's Deli which has been around since +++ and is also located on 52nd just down the road from Tenuta's towards the lake. just another spot where I could feel it was good. 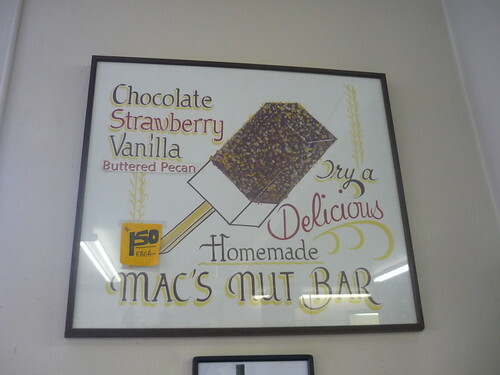 On my 1st ever trip to Mac's I just stopped in having just ate a bunch. I wanted to scope it out and grab a water for the ride home. The traffic was flowing and it looked like a great neighborhood spot and I knew Id be back. Yesterday was that day. I read on Yelp the few reviews of this place and they all seemed to agree the food was great but the owner and her workers were cranky and rude and sometimes lazy. All of that was not true on my visit. The current owners bought the place from the nice lady who runs its husbands father. Her father in law who they bought it from was Mac who started it back in the day and I think she said that it was in year number fifty two. She said she was from Kenosha moved to Highland park lived there for 10 years then got married and moved back to Kenosha and bought this place with her husband from his father. She said she went to culinary school and the only thing on the original menu were the beef bombers, Italian subs, pastrami, hot dogs, pulled pork from a package and in her words "those nasty rib sandwiches that aren't even ribs" along with the fresh homemade sausage and deli goods. 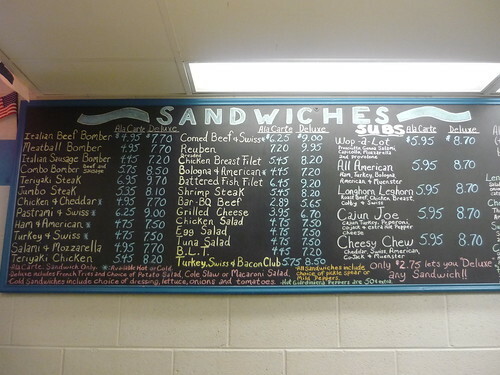 So first thing she did was get rid of the rib sandwiches (local kids loved the hot dogs and complained she said so she kept those) So really redid the menu to make it a great little corner deli that anyone would want on their block. It seemed like she knew what she was talking about and she totally redid the menu and kept the old original favorites just the way they were. 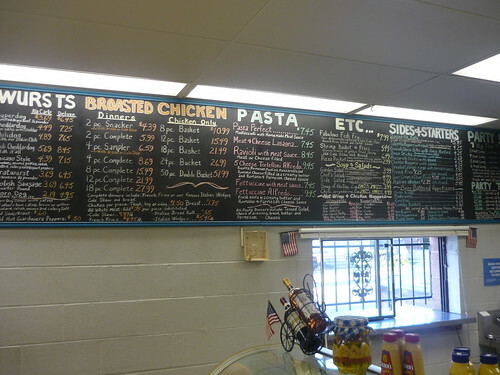 Its really a great little stop now and they also have a real smoked in back pulled pork they offer along with a bunch of homemade pastas and salads and a sandwich of the day. They even dd a fresh tilapia on Friday's that people really love. All the bread comes from the old school Italian bakery directly across the street. The high school kids were real helpful to me when I wanted to know a few things so I don't know what the people on Yelp are talking about, as usual. I started off with a meatball bomber with cheese and hot peppers and a point root beer and brought it outside to their nice little dining area. I first noticed that the meatballs were done in patty like form and she later explained we do that so they aren't popping out in each bite and it makes sense. Sandwiches are available in 6 and 9 inch portions. This was an excellent meatball and way better than anything I have had around here. When I was sitting outside I saw this sign and knew I wouldn't be leaving without trying another sandwich. So I went back in and the wonderful owner asked me what the deal was, why I as still hungry? I told her that I just saw the sign and now I have to try anothe. She laughed and I ordered up a roast beef bomber from her workers at the deli counter. When she came out side to see how I liked it I asked if the bombers were a Kenosha thing and she said yes but I couldn't get much further without her explaining to me the cooking process of the beef. It takes them two days to cook theirs and they basically shred it and or pull it apart and its also got a great gravy flavor. This bomber was very good one and also something I would order again. Im now on the hunt for best beef bomber in Kenosha. She then told me that they also make the corned beef the same way as always and insisted she bring one out for me to try. I couldn't say no to free food so she brought it out and explained some people don't like that we use the bakery across the streets bread and not rye so they are turned off. 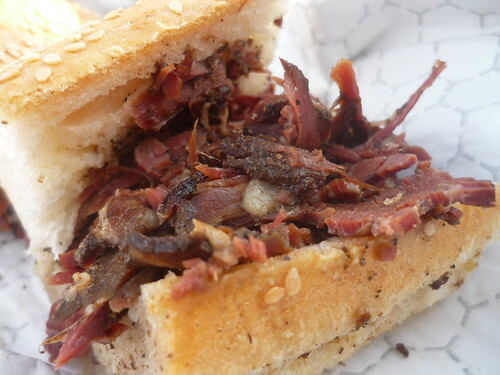 Others have been going there and ordering a pastrami for their whole lives a few times a week. Its dipped in an au jus and I thought it was awesome. She just brought it out so it didn't have any toppings but they weren't needed although next time Ill get it with mustard and Swiss. Its served hot and the dipping part makes the bread a little soggy at the bottom ala a Italian beef. What a great little corner spot this was. 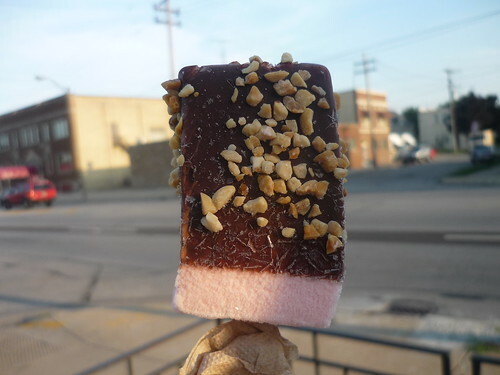 You just don't got these type of joints in Chicago anymore. 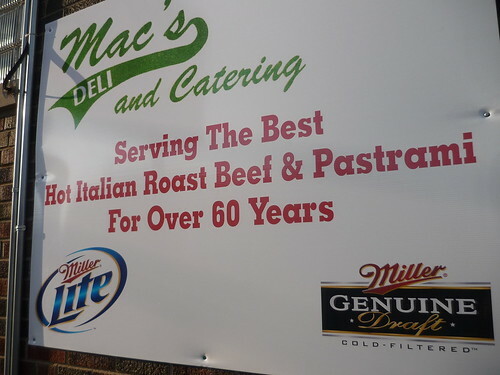 Mac's is just across the street from the Italian-American club. Does anybody have any other delis in the area that are must trys? what about the history of these bomber sandwichs? any other great bombers that need to be had? thanks for the tips. Titus. I've thought about taking the Metra up to Kenosha in the near future. Are any of these fabulous places within walking distance of their Metra station? You've hit my three favorites! In fact, congrats on finding them! I drove by Lenci's for years before I even figured out they had a real kitchen in back!! Love that place, great fresh olives and deli items. They also carry the full line of Cardinali Breads including the hamburger buns. Mac's is a great place too, but it can have a lousy element with some of punks that hang and loiter there. Don't know why she spoke ill of the Cardinali bread across the street that makes some of the best hearth baked breads in the entire region. If they are open, stop in and get the premade garlic breads and pick up a few fresh loaves of bread made that day. There is the Hungry Head on 75th, which is a bit more of a sub shop but where they definitely are making everything fresh to order. 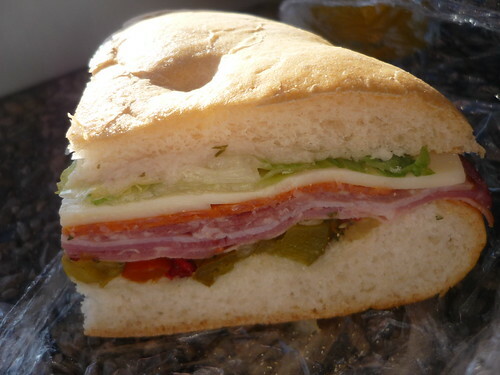 And in Racine there is Lee's deli, but again, it's more of a sub shop than Italian deli. 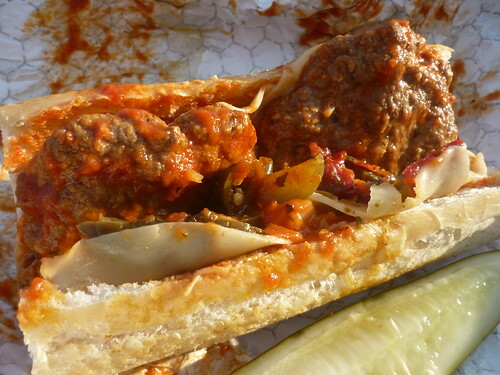 If I was a betting man, my money would be on Lugi's as to having the best bombers, not that I know if they have it or not for sure, but its just a hunch, since they are one of the best old school red sauce Italian places that I know of. They also make a nice, thick, homemade pasta and have just about the best pizza in Kenosha. I think I just decided where I'm going for dinner this weekend! ChgoMike wrote: I've thought about taking the Metra up to Kenosha in the near future. Are any of these fabulous places within walking distance of their Metra station? Great food in Kenosha is not very far from the train, Franks Diner (one of the best diners anywhere), is just a few blocks east of the station. The Sommelier has inexpensive, frequent and fun wine tastings, and Pazzo is a great place to listen to drink & listen live jazz, its fun to go on the rooftop during good weather. Due to the distance of about 3-5 miles,I would say it’s a bit far to walk, but there are plenty of cabs and busses around town, of course, if you want see the best Kenosha has to offer and go to the below mentioned Mac’s Deli or Tenuta’s, that would be your best bet. Yes I remember the owner at Macs asking if I took the train which she mentioned was up the road. Tenuta's would be a short bus ride and walkable from Mac's. I dont know the exact route but Lenci's isnt far from the other two. abf005 wrote: You've hit my three favorites! In fact, congrats on finding them! 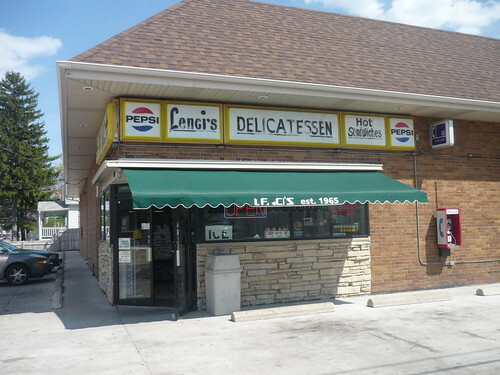 I drove by Lenci's for years before I even figured out they had a real kitchen in back!! Love that place, great fresh olives and deli items. They also carry the full line of Cardinali Breads including the hamburger buns. Thanks for the tips. Im def going to try the garlic bread next time I'm in the area and Luigi's is now on my radar. I thought and assumed that macs got its bread from the bakery across the street? Ive been to lee's but not since last summer and I think I enjoyed it b/c dont remember hating it but need to get back there. 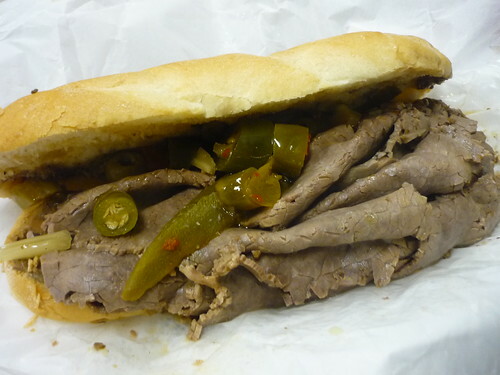 Well, I wanted to make a Tenuta's run and it was time to let the kids expend energy against a museum anyway, so I looked up this thread and found Lenci's and its regional variant on Italian beef, the bomber. I'd love to report back that it was a wonderful discovery, but it really, really isn't. As often seems to happen in Wisconsin, something potentially as good as Chicago ethnic street food is killed by bad middle-American food habits and products, like the decent sub I had one time that I scraped practically a whole jar of Miracle Whip-with-Italian-seasoning-in-it off of. In this case, the bread was Wonder soft, had none of the resilience and character of even a Gonnella roll, and the beef (decent enough) was drowned in a blandly sweet pseudau-jus that suggested a meeting of Kitchen Bouquet and Karo syrup. One son ordered the combo, and his was made even less appetizing by a pale grey tube of meat plopped in the middle, that might have been perfectly decent Italian sausage if it had been grilled or fried, but looked downright surgical when boiled. It's rare he doesn't eat every last scrap of meat on the plate before him and then start foraging on others' plates, but he let this one go after barely a third forced down. On the other hand, son #2 reported that his corn dog was excellent. I suppose we'll try the other place mentioned someday, to see if there is a good version of the bomber to be had, but nice as the folks at Lenci's were, this was a pretty disappointing meal. Tenuta's was great as always, though. I picked up a couple of 12-pk samplers from New Glarus and something called Horny Goat Brewing Co., and then we got suckered into a sample demo with a very nice Italian guy from Academia Barrilla and wound up buying an unfiltered olive oil, some peccorino romano, and a spreadable parmiggiano reggiano (!) Bizarre, I bought it mainly because it did seem so weird, but it's kind of tasty, like slightly more tart creme fraiche. I'm sure I'll find some use for it. Anyway, Tenuta's and the Civil War Museum were a worthy combination, and Lenci's was at least worth a try. The soon to be famous Deli Station is closed. Sorry to hear that, especially for you. I tried calling them several times this week, their phone was unanswered. I had really looking forward to going there. Part of the Deli Station's problem was they had an grand opening celebration August 18th sign up well into December across the top of the deli. Sends the wrong message when you don't take old signs down. It made me think they were on the way out. abf005 wrote: If I was a betting man, my money would be on Lugi's as to having the best bombers, not that I know if they have it or not for sure, but its just a hunch, since they are one of the best old school red sauce Italian places that I know of. I don't have a lot of bomber experience but I thought Luigi's roast beef bomber was good, not great. The sweet peppers helped a lot but the sandwich was still pretty dry. In Kenosha, does one order it dipped? The bread seems like it might not hold up to that treatment. funholidaygirl wrote: Part of the Deli Station's problem was they had an grand opening celebration August 18th sign up well into December across the top of the deli. Sends the wrong message when you don't take old signs down. It made me think they were on the way out. Here's Deli Station as it appeared on 20 January 2010. It was clearly closed but the interior looked untouched (so it's conceivable it could reopen). Racine-The Deli Station 1516 State St., which opened in early 2009, is now closed. The store had been closed for at least several days, according to the next door neighbor Jay Yoon, who owns Young's Beauty Mart at 1512 State St.
David Katz, with R & D Katz Real Estate that owns the State Street Shopping Center, confirmed that the store closed earlier this month. "The sales weren't there," he said. Deli owner Gal Friedwald told the Journal Times that he opened the store at the center because his cousins own the center and gave him a good price on the rent. I was born and raised in Kenosha. I do not know the history regarding :"THE BOMBER", but I do know that K-town has the best bombers anywhere in the world & Italian food ever !!!!!!!!!!!!!!!! I grew up right around the corner from Lenci's - literally - on 45th street and 20th ave. Hands down, they have the best Italian bombers in the world. However, year's ago, Fon Tan Blue - which was a drive in - had the best bombers ever - owned by the Perrine family. They were located across the street from Holy Rosary Catholic Church. God, how I miss going to Fon-Tan-Blue. The best place to have pizza from is Pa's Pizzeria. Totally kickass pizza! Tenuta's and Mac's also serve awesome bomber's. Thanks and hope you come back with more Kenosha information. I think we need to do a bomber tour of Kenosha sometime soon, followed by pizza at Well's. What do you think of Well's? It's on my short list of places to visit. Anne, do you remember the other famous sandwich at Fon Tan Blue? It was the "Soakie," which was the bomber without the meat balls. 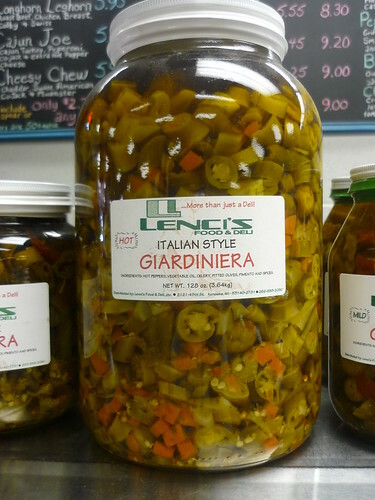 Lenci's was run for many years by Rick Perrine. Rick's younger brother, Lou also worked at Lenci's. Lou went on to open Perrine's on 52nd and Sheridan, as well as a second store on 22nd and a third on HWY 41 and Russell Road. Remember Ron's before it burned to the ground? How about Burger Chef on Sheridan?